The problem with pizza wrapped in bacon is there's never enough of it. Oh, and all the health problems associated with the calorie intake, but mostly that first one. 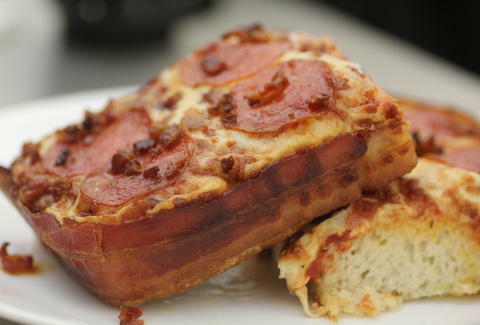 Originally released in February of last year, Little Caesars' Bacon Wrapped Crust DEEP!DEEP! Dish pizza was a short-lived gift from the grease gods. Its limited release ended in May 2015, but now, it's back. Basically, it's an 8-cornered pepperoni pizza with 3 1/2 feet of bacon wrapped around it. 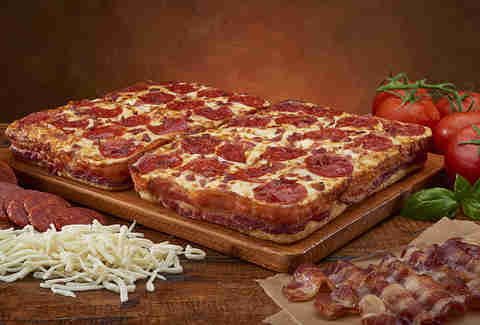 For those who've never tasted this gluttonous feast, Little Caesars' Vice President of Global Marketing Edward Gleich describes it with the words, "We take our Detroit-style deep dish pizza and surround it with a beautiful wall of meaty bacon to create a smoky, crunchy masterpiece." But for another take on what to expect from the pie, maybe read this taste test. It's like the bacon is hugging the pizza. And that's beautiful. Kara King is a News Writer at Thrillist and likes her bacon extra crispy. Send news tips to news@thrillist.com and follow her at @karatillie.